When visiting the Trick Eye Museum, bring a camera and a friend. I asked have strangers take photos for me since I went in solitude. It would be way more fun to come with someone. The museum was packed with families and tourists. There were a handful of couples as well. And boy was it busy for a Tuesday afternoon! Admission fee: 15,000 won (approximately $15 USD). 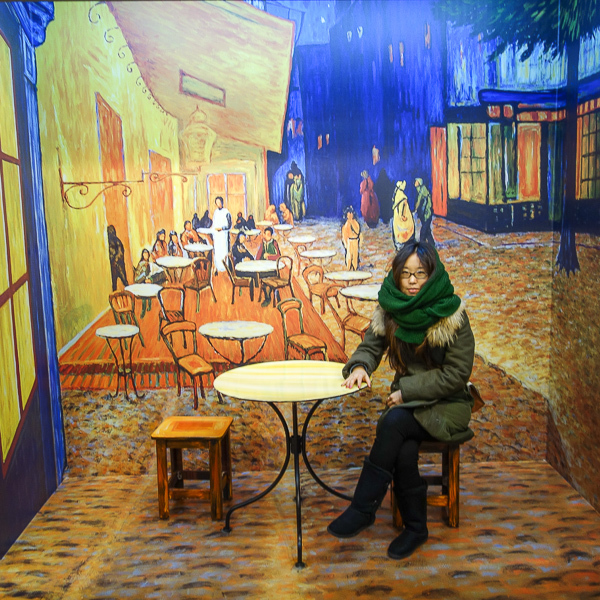 You stroll through the museum and take photos in front of three-dimensionalized paintings, including Van Gogh's "Cafe Terrace at Night." A framed version of the previous painting. Trick Eye Museum must really love Van Gogh. Hug a bamboo tree with your panda buddy. Stick your head on Superman's body and feel awesome. Or sneak a peek at a ding dong. One day I will ride a real camel in the real Egypt. For now this desert scene will suffice to take my mind off from Korea's cold winter. I don't know about you, but if I had wings I'd ditch the bike. The Trick Eye Museum is comparable to visiting a wax museum: just for fun, but nothing revealing about the country you are visiting. It serves as an icebreaker for people on dates and is ideal for children who need a little break from historical museums.